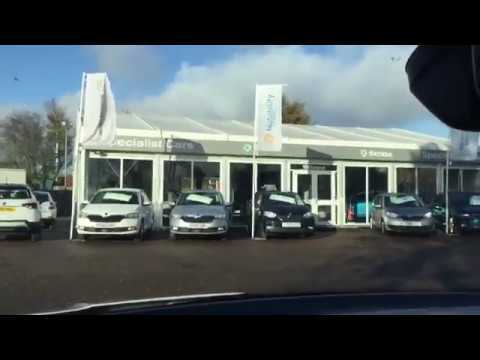 Specialist Cars SKODA are getting a new showroom! Specialist Cars SKODA Dundee are currently undergoing significant refurbishment works to upgrade our facility to meet with the manufacturers interior and exterior standards. The development will offer our customers a vastly improved showroom and aftersales environment and we look forward to welcoming you to our new home in early February. In the meantime, the team will be moving into a temporary building on site, so please be assured that it will be business as usual. The only key change being the Specialist Cars SEAT, SKODA and Clark Commercials servicing department will all be under one roof and entered via the same door (in the SKODA building). We will of course endeavour to maintain our high levels of customer service during this period of time. So, while it might look like a building site, please do not hesitate to come and visit us in our temporary building, we will still have plenty of tea and coffee for you to enjoy, and if you have any questions we will be happy to assist. This is the 3D render of what our new showrooms will look like! We are very excited to see this vision completed early next year, and to celebrate our new Showroom we are planning on having a launch event (date to be confirmed nearer the time), if you would like to come along please register your interest via the form below and we will be sure to add you to the guest list!